Beautiful Incentives: Bulu Box-1 Year Subscription Giveaway! 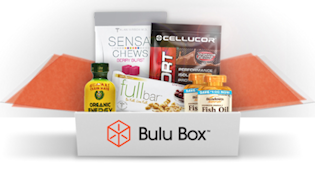 Bulu Box-1 Year Subscription Giveaway! Welcome to the Grand Bulu Box Giveaway! I love teaming up with other bloggers to share the biggest and the best chances with you! This box is supposed to be amazing from what I have heard! You could win a whole 1 yr subscription to this AND give one to someone else! It's one of the more unique and very useful ones! The Bulu Box is the perfect example of try before you buy. Every month you will get a box with samples to try, along with coupons and discount codes for full-size products. Bulu Box is The first vitamin and supplement nutrition sample box for women and men. Try 4 to 5 nutritional samples monthly before you buy and discover what works best for your body. Watch the video to learn more. Right now you can GET YOUR FIRST BOX FREE! All you do is sign up at Bulu box and use the code 1FREEBOX and your first month will be free. You can cancel anytime but you might want to stick around and check it out because I have heard that they have had some pretty worthwhile boxes!! 1 year Gift Subscription ($120 value) AND a 1 year subscription ($120 value)… winner will get a 1 year subscription and can give a 1 year subscription to a friend. Perfect Giveaway right before the Holidays..you have a gift to give a friend!! The Giveaway will open up on 11/28 at 12:01 am EST and Close on 12/12 at 11:59 pm EST. Enter via the Rafflecopter below. Good Luck! a Rafflecopter giveaway Blogs are not responsible for prize fulfillment. Sponsor will be sending the prize. Winning entrant will be emailed and be given 48 hours to respond before another reader is chosen. Giveaway is open to US residents only. Complete giveaway terms and conditions.